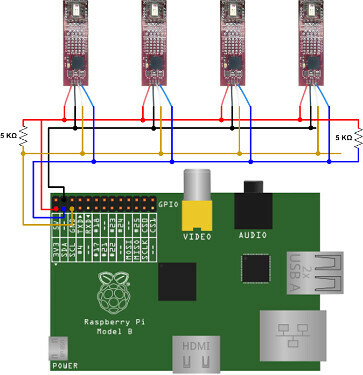 This tutorial covers the steps required to connect TakkTile sensors to the Raspberry PI directly using the I2C bus. This has been tested connecting the TakkTile Kit for Robotic to the Raspberry PI I2C. These instructions were obtain from this instructable. In this file, there is a comment, and two lines. Add a hash before the I2C line, to comment it out. This should have the line i2c-dev added to the end. The I2C driver accepts an option - baudrate - which defines the default communication speed for the i2c bus. The default setting is 100000 (Hz). $ sudo bash -c "echo options i2c_bcm2708 baudrate=375000 > /etc/modprobe.d/i2c.conf"
375 KHz is the maximum value that I have managed to use with the `smbus` library and the takktile sensors. Increasing the baud rate from 100 to 375 KHz increases the acquisition rate from 20 to 50 Hz in our setup (12 sensors = 3 strips, 4 sensors per strip). Go to your ROS working directory. e.g. Now compile your ROS workspace. e.g.